Family Friendly Older kids with geared bikes will have a total blast on this loop. Just be sure they are accustomed to climbing before embarking. 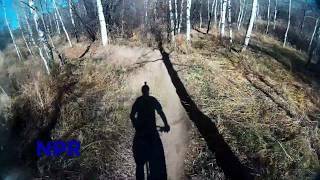 While most all the trails at Emerald Mountain are good, only recently has the City of Steamboat created beautiful, new-school, purpose-built singletrack on the hill. This ride tours the best of that singletrack, providing you with aspen-drenched climbs, gorgeous views of the valley, and best of all, a world-class downhill flow trail that is suitable for all levels of riders and never sees the blown-out tread of lift-serve trails like Rustler's Ridge across the valley. 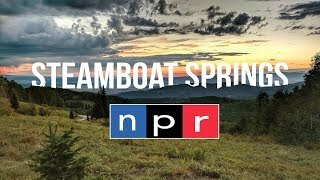 Seriously, Steamboat has upped their game with this set of trails, truly putting their money behind their claim to now be not just "Ski Town USA" but "Bike Town USA". While you may have to wait to get in, the Creekside Cafe and Grill at 131 11th Street serves up fantastic breakfast and lunch fare that is sure to satisfy after a weekend ride at Emerald. While Morning Gloria provides welcome shade, the beginning part of this ride is unshaded. As such, on hot days it's best done in the morning. You'll want to start this ride at Howelsen Park, but finding your way around there isn't always easy if this is your first time. Whether you're coming from the bike path or a car, go past the park sign and take your first left in front of the tennis courts. Continue down the road as it swoops to the left to pass a baseball diamond before reaching the horse rental stable and a parking area. Park here and ride south (toward the hill) to find a small singletrack and posted park map. While the map is helpful, you're going to want to bring the MTB Project mobile app to make sure you don't get lost—navigating the trails in this park can be beyond confusing the first time you do it. Once you're ready, head left from the map to climb singletrack to the junction with Bluffs Loop. Bluffs Loop is inherently confusing at this point, but if you just make right turns whenever possible, you should make it where you need to go. Regardless, follow signs for Lupine to eventually reach your next trail and plenty of switchback climbing. Heading up Lupine, plenty of switchbacks bring you through varied open and forested terrain. While you might encounter the occasional technical challenge (manifested as mini rock gardens), this trail is primarily buff, allowing you to focus less on staying upright through the rocks and more on your breathing and your surroundings. Partway up the trail, Morning Gloria appears in the apex of a right-hand turn. Head left to leave the scrub for the forested, rolling contours of Morning Gloria. At first, Morning Gloria provides a nice change of pace through rolling terrain and gentler grades, interspersed with occasional small obstacles. For the next few miles, the trail takes on a general character of gentle grades, numerous wide, gentle switchbacks, and an occasionally dusty tread. Dust aside, this trail traverses some of the best scenery in the area, with monster ferns growing right alongside the trail underneath towering aspens that make for a real spectacle in the fall. Eventually, Morning Gloria will leave the gentle grades of the aspen forest to climb a switchbacking bench cut along the hillside to crest the ridge. Steeper switchbacks may test less advanced riders here, but give it enough gas and they should be able to make it through without much issue. Once at the top of the ridge, the trail continues to climb and contour to eventually reach its end in a junction with Quarry Mountain and the Ridge Connector (service road). Up here, enjoy a fantastic view of the valley below as you take a quick break and grab a snack. When you're ready to press on, drop your seat, open up your suspension, and click into high gear, because in regular Steamboat fashion, the rest of this ride is a hootin' an hollerin' good time! The descent begins with a cruise down Quarry Mountain as you navigate a nice narrow tread and plenty of tree'd pinch points that will put your ability and the width of your handlebars to the test. After a quick run down Quarry Mountain, take a right at the junction with Blair Witch to cruise out to Blackmere Road. From here, you have two options: for those with an affinity for ledgy, moab-style chunk, continue across the road to tackle a descent of Little Moab. If technical slab riding is not your thing, head left to cruise down the road for a short while to reach the beginning of the main event just up the road (left) of the end of Little Moab: NPR. NPR is hands down the best new school flow trail in the Yampa Valley. While you may argue that the lift-serve trails on the mountain are better (think Rustler's Ridge), NPR offers the same style of trail, with rollers, pumps, and plenty of tabletop jumps, without any of the deterioration that the bike park trails see over the course of the summer. Overall, NPR (No Pedaling Required) boasts nearly 100 features including buffed berm turns, flowy rollers, and low-consequence table top jumps that are all rollable. At the first road crossing, make a slight left on the service road to pick up the next segment and then continue straight through another service road intersection to pick up the last few sections of flowing singletrack bliss. When you reach the end in a 180 berm, take Mile Run down to the parking area and find your car. In great shape. Just a few puddles. View from Emerald Mountain snowbiking.